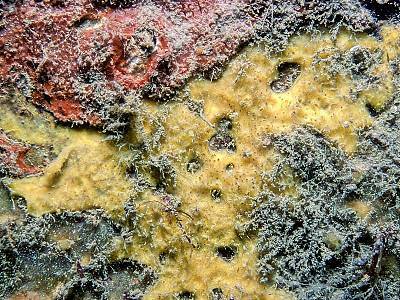 Description: This sponge consists of a thin yellow encrustation usually covered with some adherent silt. Typically it forms irregular patches with some holes. There are inconspicuous darker excurrent channels which converge on regularly spaced small oscules. Habitat: Usually on steep or horizontal rock surfaces with some silt covering. An open coast species which is normally in 25m or greater depth. Distribution: Western coasts of the British Isles. 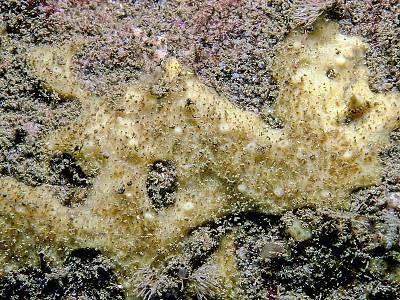 Similar Species: There are a number of similar yellow encrusting sponges and microscopic examination of this species is necessary for confirmation. Once a population has been confirmed in an area it may be recognisable in situ. Picton, B.E. & Morrow, C.C. (2016). Paratimea constellata (Topsent, 1893). [In] Encyclopedia of Marine Life of Britain and Ireland.